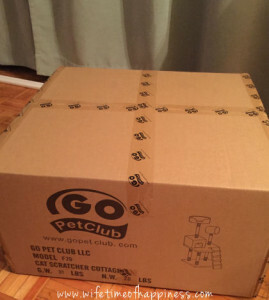 I have to say, the quality of the Go Pet Club Cat Tree is MUCH nicer than the stock photo shown upon purchase. I mean I was really pleasantly surprised – much more so at the great price paid. 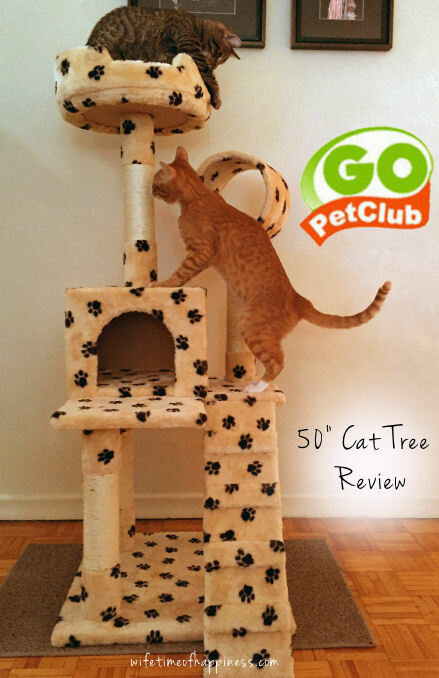 Join me now for my review of the Go Pet Club Cat Tree! Since we were adopting 3 cats, we wanted a tree that had multiple features. I also would have liked a toy attached, but figured really..That's no big deal to hang one myself. 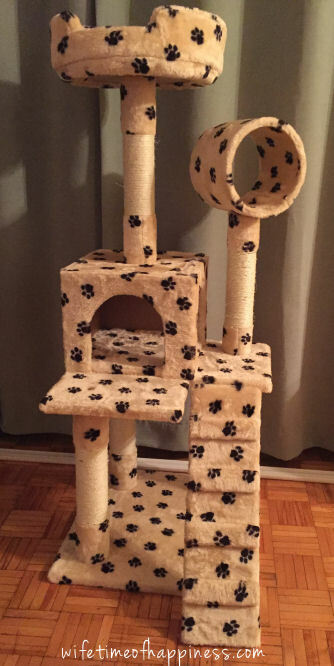 I decided to go with the Go Pet Club 50-Inch Cat Tree (Paw Print). 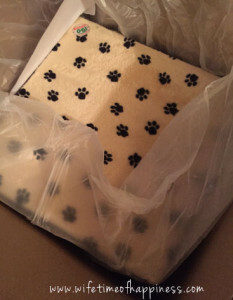 Let me just tell you Go Pet Club and Amazon were outstanding with both shipping and packaging. Has all aspects that kitties love! No real cons (so far) except you may want to put a mat under the tree itself, as the screws on the bottom will scratch the floor. So how do my cats like it? Our cats are brand-new (to us). They are adopted and this is now their 3rd (but final!!) home. It hasn't taken them long to adjust (they have been here less than a week), but they are definitely still seeking out their bearings. If you're thinking about investing in a little play center/cat tree for your cat – I would definitely recommend going with a Go Pet Club tree. I will not hesitate to purchase again as needed, or maybe another (smaller version) for somewhere else in our place – They all seem to be fighting over the little hut now hah. Want to treat your furry friend(s) to some fun? I hope this review has helped you out! This entry was posted in Cat Product Reviews, Pets, Product Reviews and tagged amazon cat tree reviews, best cat tree, budget friendly cat condo, budget friendly cat tree, buy cat condo, buy cat tree, Canadian Blogger, Canadian PR Friendly Blogger, Canadian Review Blogger, cat condos, cat product blogger, cat products, Cat Toys, Cats, christmas gift ideas for cats, christmas gifts for cats, fun cat condo, fun cat products, fun cat tree, gift ideas for cats, gifts for cats, go pet club 50 inch cat tree, go pet club cat tree review, go pet club cat tree reviews, Hire a Blogger, paw print cat products, PR Friendly, PR Friendly Blog, PR Friendly Blogger, PRFriendly, Product Review Blogger, Review Blogger. 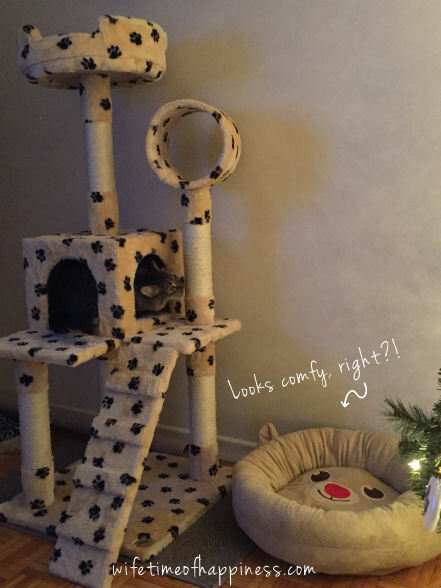 That is a really nice cat tree! We also have a cat tree, but I really like the paw pattern on yours.